Feeling pretty tired this week thanks to the mad scramble to finish the latest Future Music commission on time. Being the shallow gear heads that we are, to cheer our selves up (and a vain attempt to get moving on the next project) we indulged our love for vintage drum machines with another couple for the collection. 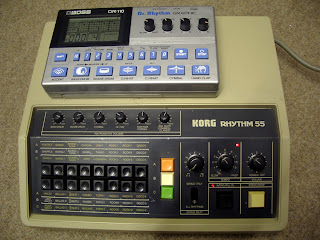 The Korg KR55 (the big one) is a preset rhythm machine (complete with foxtrot and 3 bossa patterns! ), with that classic analogue sound. It is possible to midi-refit these machines so that the sounds can then be triggered from a sequencer- the KR55 as it stands can’t be programmed. We’re going to look into it and will let you know how we get on. The smaller machine is a Boss DR110. We’ve wanted one of these for a while and it’s the last true analogue drum machine that Roland/Boss produced. Programmable but with no midi, it’s a great machine with a fantastic clap sound. When we can get our heads round our FTP program we’ll try and get some samples uploaded.